7.56 points at 43 votes (rank 184). The graphics of this game are advanced for its time and the menu design is very original. While selecting your car, many technical details are provided. While driving, you see a cockpit with a the original dash board, including the original gear-lever in motion. The game starts with a very decent intro. There's no textual menu. Just the first car appears. If you want to drive with it, you hit the button and it'll drive. Otherwise you can see the other cars by moving left or right. This way of menu construction can be found in other games by Accolade as well. Then directly you're there on the street. The design of the street itself is kept simple. At the right side there always is a mountain, at the left side a ravine. The others cars on the road are different from each other, but not very detailed. Although, detailed enough to recognize a VW Beetle from a truck, and in different colours. When you play the game more often, you will notice that there's no random appearance of the other cars. To shift up, push forward and press fire. To shift fown, pull backward and press fire. The game ends when you finish the 5th stage, without crashing too often. Crashing the police car will result in an immediate game over. Theoretically, a high score of more than 50000 should be possible. First stage: 8512 points can be collected. You should drive either the Lamborghini or Ferrari to do so, without any hesitation. To maximize the score you have to crash just before the gas stop. 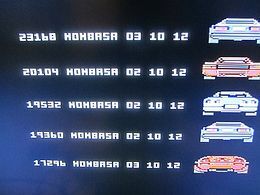 If you drive one of the three other cars, you're still able to earn at least 7232 points. Second stage: even more points can be gathered in this stage, since it's a longer stage compared to the first stage. The solution is: full throttle. Third, fourth and fifth stage: in these stages the corners are tighter, and here it doesn't matter any more if you drive the fastest car or not. Exercise, experience and some luck are the keywords. 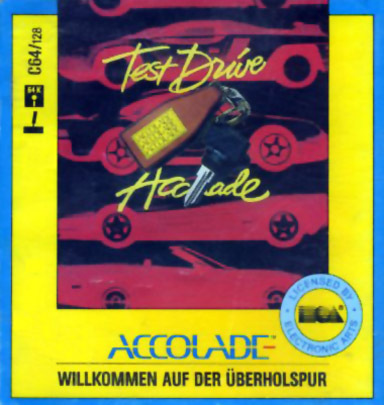 Guybrush: "A classic, even though the graphics could have been a bit better in 1987 and the course of the game is a bit monotonous, Test Drive was fun, 7 points from me." Patrick Rüegg: "I can remember 0this game, it was just great. Memories come out! 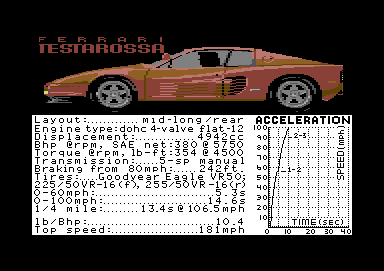 I don't think that about the graphics, that was absolutely normal for that time. The cars are also classics (Countach, 911), just great, 10 points." Shakermaker303: "A game with cult status. You were quite hip on the schoolyard, if you could claim to own Test Drive or even have driven to the first filling stations :-). 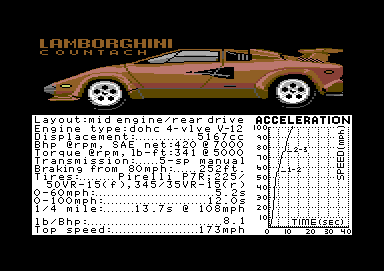 Of course the graphics of the single cars in the menu was breath-taking at that time, the cockpit of the car during the game was individually and nicely designed, however, the mountain road has become a bit too simple. I give 9 out of 10 points - pass any low planes?" Sometimes suddenly the police car appears in front of you, it comes from nowhere! As quick as it comes as quick as it goes: within a second it has gone, but watch out that you didn't hit it. 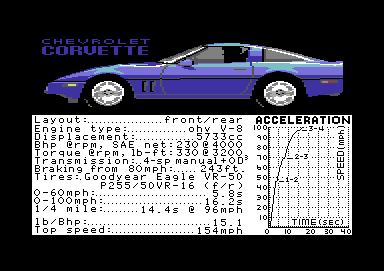 The Chevrolet Corvette in driving mode should have - according to the car specifications in the beginning of the game - four gears plus one overdrive. Instead, while driving there are only three gears available plus one overdrive. This can be considered as a bug, because the gears and other details of the other cars are corresponding with the specifications. 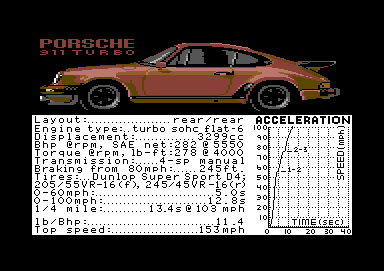 Not really a bug but nice to mention: the actual top speed of the cars differ from what is said in the specifications. Most of the cars drive a little bit faster. This page was last modified on 5 March 2016, at 16:59.